We offer experienced and certified guides for all of our organized treks, but also make available guide services to independent trekkers who want to plan their own routes and make their own trekking arrangements for a basic fee which covers the guide's salary, food and insurance. Several of our guides are part-time students from rural areas who supplement their income from guiding to put themselves through school or college during the off-season. 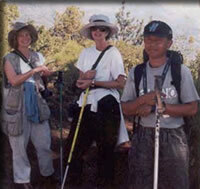 We recommend the use of experienced guides while trekking in Nepal. Their knowledge of the trekking area guarantees the best camping sites, lodges and trails, and prevents those three hour mistaken “short cuts”. Of equal importance is their insight into Nepali culture and customs that trekkers would otherwise miss traveling alone on just accompanied by other foreigners.